Knowing that the male wardrobe enables less general fun than the female wardrobe, do you prize the same things both in menswear and womenswear? I do not believe that menswear is any less fun than womenswear, however the opportunity for everyday creativity is certainly less accessible. Given that the fashion industry has for the last century been inherently targeted at women, it is understandable that there is more choice and creativity where womenswear is concerned. That is not to say that menswear designers are falling behind in any way, but rather that menswear has yet to gain that diversity. I often feel that menswear is the safer option for designers, simply because it has less competition. Menswear has always been somewhat of a dark horse, in that it is usually rather understated when compared to womenswear. However one can certainly look towards the concepts and theatrics of contemporary designers such as John Galliano and Alexander McQueen, and note the playful nature with which they present their views. Indeed in spite of such celebratory and wild fashions, I feel that menswear is perceived as less exciting than womenswear, simply because it is less well documented and publicised. It is certainly easier for women to have fun with their clothing, simply due to the availability factor. One notes on the high street that your average store will have two floors dedicated to womenswear, whilst the corner of a single floor contains the menswear. Even then, this is found on the underground floor, where an absence of natural light and enclosed space makes the idea of simply walking into a store to browse all the less inviting. Indeed stores are designed around catering for women, and that in itself makes it just that little bit less accessible for men. They may only be small differences, yet those small differences subconsciously make men less willing to go inside, even if they happen to be less interested in clothes shopping in the first place. Yet this is certainly understandable given where the consumer power within the market lies. However this also naturally means that there is far less available in your average store when it comes to choices of menswear. As a man, I do believe that my appreciation of womenswear is somewhat different to how I view and appreciate menswear. I can not realistically fully understand the everyday practicalities of a womenswear collection, and as such I may not always look at the sky high heels or choices of cut from that perspective. This is in contrast to perhaps my own first opinions of a menswear collection, where I make a decision on my own personal wearability choices. Yet, I also happen to look at fashion from the perspective of fashion as art. I can appreciate a beautifully crafted and executed collection, even if I may not be able to fully relate to the practicality of the finished garments. Concept is a very powerful thing, and indeed, I appreciate both mens- and womenswear collections from a conceptual and artistic viewpoint. In general I suppose that my views of menswear is tempered slightly by the factors of practicality and pieces that I myself would love to wear, whereas when I view womenswear, it is much more to do with the visual and conceptual appeal. Whereabouts in London do you find the most inspiration and why? Inspiration is but a fleeting concept, it is not one that can truly be defined or categorised. One can find inspiration in the most beautiful of things, yet also in the most ugly. One may be inspired in the very moment of an experience, or many years after, for inspiration is one of the few concepts that never does seem to abide much by the constant of time. Whether one is inspired to write having just seen a flower, or to film a documentary having been faced with death in the past, inspiration can come from any source. As such, I do not believe that one can have a singular point of inspiration. Indeed one can also never second guess inspiration. I believe that you simply have to live and let inspiration find you, in whichever form or appearing that may occur. There is no real location which I find most inspiring, although there are certainly those in which I find myself in awe of my surroundings. There are locations which hold certain meanings and memories, locations in which I am enamoured by their natural beauty, locations in which I find myself bored. However, I find myself mainly inspired not by locations, but rather by the people therein. I suppose in particular I am inspired by my family and friends. It is people that inspire me the most, for the people we love make life worth living. People shall always be the most interesting and complex of mysteries - even once the wonders of the world are solved, the secrets to the wonders of humanity shall remain ever elusive. Which style trends have you noticed and loved or loathed on the streets of London lately? If you are over the age of five please do not, under any circumstances apart from pain of death, wear Cr**s. I dislike saying what I believe others should or should not wear, but these mockeries of footwear make me physically ill. Even worse is when the offending items are worn with socks, or indeed even on suits (I kid you not, I have seen this on several different occasions). there's facebook group...which i joined...called "I don't care how comfortable Crocs are, you look like a dumbass". Such vibrant colours DK! They made me smile. Oh, I also noticed you changed the colours of your layout....I like the tweak :) Which animal friend did that for you? Fab post, DK! I despise cr**s but love DSquared2! Adoooooore your new format, darling! HAHA i love how you use it as a bad word! i was confused for a moment but i totally agree with you on it! maybe if i was senior age and didn't care but i hope i never get to that point! For me, menswear faces an interesting dilemma as the most innovative and inspired pieces are not easily translated into wearable looks. McQueen, Galliano, Gareth Pugh, Rei Kawakubo, Miharayasuhiro etc. have really designed outside the box in terms of menswear cuts, fabrics, colors and styling. Moreover, the brilliant Nicolas Ghesquiere--to me--has consistently created innovative menswear for Balenciaga even though it is often overshadowed by the amazing womenswear collections. I completely agree with your stance on womenswear. I am slightly disconnected because I don't wear it, but I look at the innovation and artistry involved. I can talk about this all day lol! PS. Cr**cs are a sign of the apocalypse lol...Just say NO to them! I think D Squared is such a cool line...the clothes and the people behind the clothes...LOVE that London Carnaby Street...great pic! 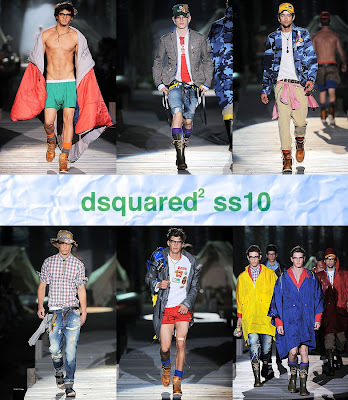 I love Dsquared2!!! AMAZING collection. And you know I die when you write about London...le sigh. Did I tell you I will be there in October?!! Miss my home of sorts. What colors in that menswear segment. Cool. Very vibrant. I love all the bright colors on these outfits. Great for summer too. 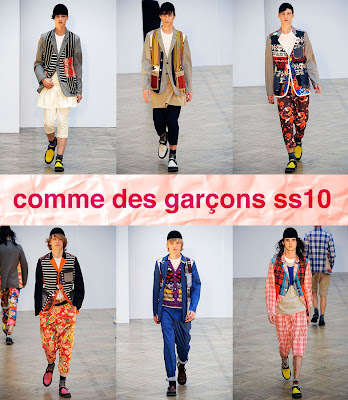 CDG has some great looks. i always love the mens collections you post. That diagram is a hoot! And I am directing my hubby to this post. He is perpetually frustrated by his limited fashion options. i agree. crocs are NO NOS! i don't care what your reason is. love your new layout dap! 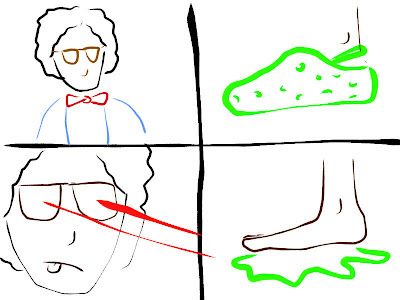 glad to find i'm not the only one who despises crocs. they're worn quite often here...people trying to beat the heat? i don't know. either way it a big NO! LOL.... Cr**s are cute when the wearer is 5, but not so cute on me. you are right, men do have less choices but there are fun selections out there. BF loves Paul and Shark. Great new format!! It very clean-looking. So true about the lack of menswear options available...apparently stores are saying men dress to cover themselves and women dress to express themselves. PS, love the new layout too! The blog looks great. 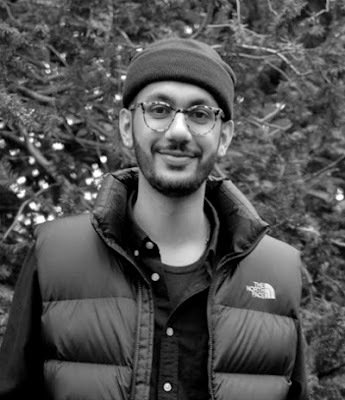 I love your thoughts on menswear. I hope you will have a great Friday and weekend. Cheers! Omg, dear, I swear if I see one more person wear Cr**s I am going to go insane. Especially at my college, people wear them with pajama pants to class. It drives me absolutely insane and makes my eyes bleed a little bit more each time! I love when Dane Cook (during one of his comedy routines) says about crocs "You arent a baby on the beach or an old woman gardening" dont wear them! haha. From one croc hater to another. I totally agree with you about menswear. It doesn't get the attention that it deserves and I imagine that's really frustrating for a lot of people. I like how you bleeped out crocs...err, I mean the shoes which shall not be named. Oh my dear friend, please be happy you don't live in Holland! Here: EVERYONE WALKS ON THEM. Seriously.. And even worse, me and my friends have a regular spot The Coffee Comapny, ten minutes from our school.. And in the same street there's a Croc-shop.. A whole shop full of those UGLY (what-they-call-it) Shoes.. Tragical.. And we have to see it everytime we go to the Coffee Company.. We only still go there because of the cute waiters and the delicious coffee. yes the shoes are so great. and I love the bows on it. what a summer, that´s not nice. because my birthday is in 10 day´s and normally we had a hot summer years before, and now.??? hmmm. maybe it´ll be better. This was a fun post. I loved the drawing too. Hope you have a good weekend. Thank the lord you hate crocs too! and I lobe DSquared!!! Mmm Inspiration. It's quite an interesting idea, isn't it? You never know when it shall befall you. I haven't quite been writing poetry or otherwise in the creative sense of late, but I've been merely writing my thoughts and questions down on paper. I'll sit down under the clouded sky at night and that will be my mere inspiration, or sometimes the sheer beauty of it will hold me back. You never know when it shall come or it shall go. If so, I definitely give you major props. I agree with the statement about the Cr**s, too. My mom will wear them with a skirt at times, and I just about yank them off her feet and, well, laser beam them. A suit?? You're kidding? Sheesh. ah me !! crocs with suits ? i love menswear especially when isee certain looks on thesartorialist clean lines with a bit of playful color . is a ll a gentle men needs sometimes . wish i could finds a guy that puts effort in to his look like you . but i show the sartorialist inspiration to some guy friends and they say only gay guys dress that way . why do you think most men/guys are afraid to dress or try to dress stylishly ? your cartoon picture is too cute!!! LOL! one of the reasons menswear is so appealing to me because there are less options. in women's wear there are just too much choice! esp. in jeans alone!!! Personally, I enjoy menswear and womenswear equally the same. I do think that fashion industry does target women far more than they target men, which to a certain degree is a loss. P.S. I have Crocs more than words can describe... Whomever created these mockery should be ashamed of themselves. And I agree about the Crocs! They're not that 'popular' here but when I go on holiday in different foreign countries I physically cringe when I see them worn on the street! Oh, I love your note about these horrid monsters thata re the C****s. Always scare me when I see them. Feels like they've sopped proliferating recently though.. let's hope so!